Yesterday , Ala, Zosia and me we did our first EVS presentation in Ilia State University in Tbilisi. We were host in the big conference room with all materials ready for us (computer, microphones, screen…), so confortable ! Of course we were a little stressful 5 minutes before to start : how to do a dynamic presentation in front of more than 100 students …?! Will they be interested …?! To attract them we did some small games: guess our nationalities, quizz about EVS, videos, powerpoint… And finally it was successful : room totally full of people; 4 papers full of email addresses; first calling in office 2 hours after; and some people interested also to participate in our French and Polish clubs ! 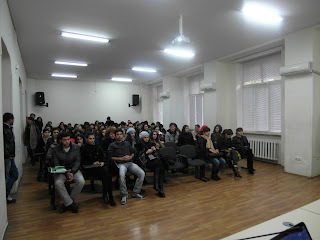 Conclusion : everyone was satisfied , students because they learned about this opportunity to go abroad for free and help people ; and us because we felt active and we were in direct contact with Georgian youth !